With a plethora of flora and fauna there is no denying how beautiful the underwater world is. 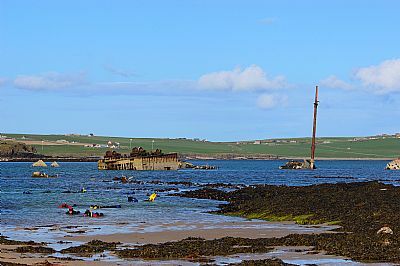 Explore the magical landscape just below the surface – kelp gardens, brightly coloured sea creatures and a historical wreck creating an artificial reef which attracts a wide variety of marine wildlife. Snorkelling is a relaxing and mesmerising experience. Floating gently on the surface, you will be amazed at the wealth of sea life around you in these shallow waters, including crabs, anemones, starfish, sea urchins and many fish including wrasse, pollack and cod. Nearby lies one of the famous Blockship wrecks - the Reginald, sunk as a Blockship in 1915 – which also acts as a haven for sea life and birds. These sessions, at a special Nature Festival rate, include an introduction to snorkelling and the creatures living around the Barriers. All equipment will be provided, including dry suits to keep you warm and dry. No previous snorkelling experience is required. You can take the session at your own pace with close support from PADI Instructors and Divemasters. There is no need to be a strong swimmer as the Churchill Barriers are very sheltered, although you do need to be comfortable around the water. It should be possible to spend up to 1.5 hours in the water, although you are welcome to come out sooner. Suitable for ages 10+. All children must be accompanied (though accompanying adults can stay on the beach). Parking is at a roadside lay-by. There is a grassy bank down to the stony beach, which can be slippery with seaweed. Enter an incredible underwater world that you will, quite simply, never forget. To breathe and move effortlessly underwater for the first time is a feeling unlike anything else. Wildlife is all around as you fin gently through this undiscovered landscape. Starfish and crabs stalk the seabed with sponges and sea urchins living amongst the wreckage of the three nearby Blockship wrecks - the Empire Seaman, the Martis and the Gartshore. Glance up and you may find a school of fish dancing overhead. The underwater wildlife is one of the quiet wonders of Orkney’s waters. Diving gives you the opportunity to get down below the surface of the water and see for yourself how on a seabed comprising mainly of silt and sand, the wrecks have become rich artificial reefs. Each wreck is now a thriving ecosystem – ocean bottom animals such as starfish and urchins cover the wrecks and jellyfish, wrasse, pollock and ling can also be seen. This whole experience, at a special Nature Festival rate, is simply about having fun, swimming underwater and blowing bubbles around Orkney's unique underwater attractions. 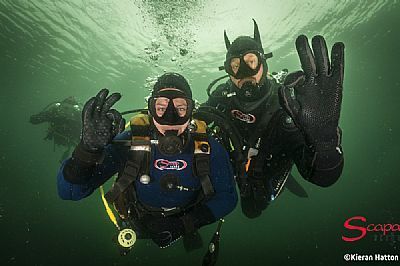 Scapa Scuba is one of the few places in the UK that can offer the opportunity to try your first dive in the sea. An opportunity not to be missed! No previous diving experience is required. You will dive under the one-to-one support of a PADI Instructor at all times, giving you total comfort and safety. The session will be taken at your pace. There’s no need to be a strong swimmer although you do need to be comfortable around the water. You will also need to be reasonably fit and healthy and complete a medical questionnaire that confirms your medical fitness for diving - we will discuss this with you at the booking stage. Suitable for ages 10+. All children must be accompanied (though accompanying adults can stay on the beach). Parking is at a roadside lay-by. There is a grassy bank down to the stony beach which can be slippery with seaweed. ​There will be a group briefing at 10 am, with individuals scheduled to dive from 11.30 am or 2 pm. In between we would highly recommend a trip to the Burray Fossil & Heritage Centre (www.orkneyfossilcentre.co.uk) and can offer with a lift if needed. The Centre has a cafe and fantastic geology and fossil galleries, including fossils of ancient sea creatures not unlike some of those still seen underwater today (entry to galleries £4.50, concessions and children under 16 £3.50).